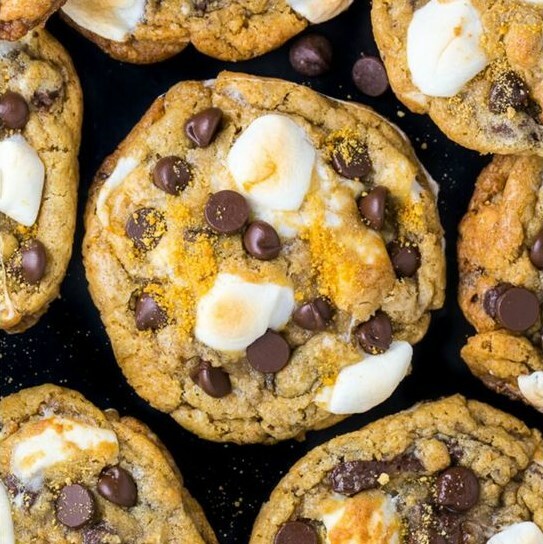 S'mores Chocolate Chip Cookies are thick, chewy, and stacked with so much gooey goodness. Simple to make and no chilling required! Moving onto the well done: S'mores Chocolate Chip Cookies!!! These EPIC treats are stacked with gooey marshmallow, rich chocolate, and crunchy graham saltines. The best part? The treat mixture doesn't require chilling! So you can have these on your table in under 30 minutes. Rapture!